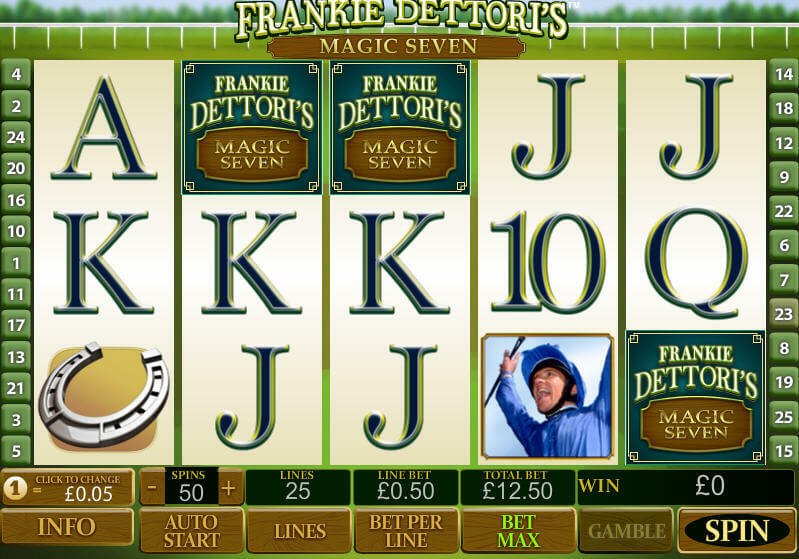 The Frankie Dettori’s Magic Seven slot machine game is a dedication to the Lanfranco “Frankie” Dettori, race course jockey from Italy who ruled the hearts of the horse racing fans from all over the world. His contribution to the sports of horse racing, as the winner of all seven races in the year 1996 while participating in British Champion’s day, is still to be challenged by any other player of the same category. His profession was inspired by his father who himself was a top notch jockey in Italy. For his services rendered to the game of horse racing, Frankie Dettoris was awarded with Order of the British Empire. Frankie Dettori’s Magic Seven Slot is a five reels and twenty five pay-lines slot machine game and has all the ingredients in the form of special features which make this game very entertaining and rewarding. 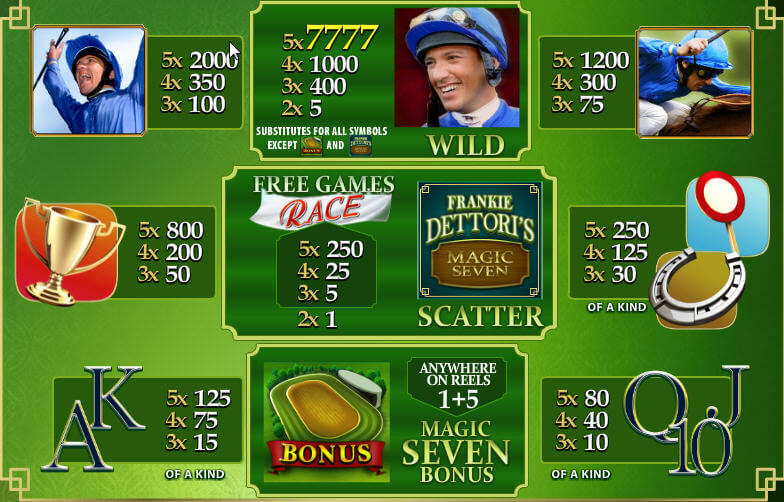 Frankie Dettori’s Magic Seven Slot game has all the usual features like bonus round, wild symbols, scatters and gambling feature. This game does not have any kind for free spins or multipliers. The maximum coin limit for this game is set up at ten coins. The minimum wagering requirement for this game starts from 0.01 and goes up to 2.00. Jackpot Features and Wild Symbols: As number seven plays a very important role in the achievements of this veteran jockey, this game has also incorporated this figure into the game in the form of Jackpot. If a player can hit five icons of Frankie with his arms up in the air, he or she can hit the second highest jackpot which gives out two thousand multiple of the line bet. The wild symbol for this game is the icon of the Frankie Dettoris himself which can replace any of the other character on the reels except the scatter symbols along with the bonus symbol. A player can use this wild symbol to make a winning combination whenever it is hit upon. If a slot player is able to hit the scatter in the range of three or more scatters then he can trigger a special bonus of free games which can range up to thirty five in number. If a player is able to hit a track symbol on the number one along with number five reel, this allows him to access the bonus racetrack which includes Magic Seven Bonus round. In this bonus round, the players can revisit the treasured moments of the Frankie’s career and they can also take part in the treasure hunt by participating in quest to hit and find the series of location which have hidden trophies or credits which have direct impact on increasing the number of multipliers provided in this game.